What does your perfect Spanish home look like? A cosy apartment in a traditional pueblo blanco? Or a luxury seafront villa with panoramic views and the very latest mod cons? No matter what you’re after, you’ll find it on the sunny Costa Blanca! This week, I’m off in search of this beautiful coast’s ‘bling’ and ‘budget’ hotspots. The northern part of this region includes the city of Alicante and its airport and the very popular town of Javea as well as Benidorm, which is still favoured by many British people. The very dry climate is helpful to people with arthritis, rheumatism and other medical problems and it is in the north that the scenery becomes exciting with high cliffs overlooking the white sandy beaches and hidden coves. The interior is known for its many hilltop medieval castles. Property on the north Costa Blanca runs from eminently affordable to gloriously luxurious. Which will you choose, and where are the best areas to look? Despite some overbuilding on the coast, mainly in the southern part of the Costa Blanca, you can find authentic Spain inland with whitewashed homes and pretty wrought iron balconies and narrow streets. These days the coastal region has a modern feel to it with a plethora of bars and restaurants to enjoy. Being the provincial capital, Alicante has a population of almost 335,000. Recently it has become one of Spain’s main ports for cruise ships and is also a university town. Alicante-Elche airport the 5th busiest airport in Spain with international flights to and from all of Europe. Fast train services link Alicante to Madrid, Barcelona and Valencia and there is a regular ferry service to Algeria and the Balearic Islands. Don’t get caught when negotiating for your price – find out our insider tips in your free guide, How to Negotiate Abroad. It hasn’t snowed in Alicante since 1926 and the city sees just under 3000 hours of glorious sunshine a year. El Palmeral park is much used by residents with its walking trails, children’s play areas, little brook, ponds and an auditorium for concerts and outdoor activities. The city has a large British population and good international and British schools. Most locals speak English too. However, it is more of a Spanish working town than a tourist spot which makes it very pleasantly Spanish. Property is generally quite cheap compared to some other provincial cities. Want further help on buying in the Costa Blanca? Don’t miss your free tickets to Your Overseas Home while they last. It’s a special kind of show, designed specifically for serious buyers to connect with and ask questions of estate agents, finance specialists, lawyers, removals experts and more. 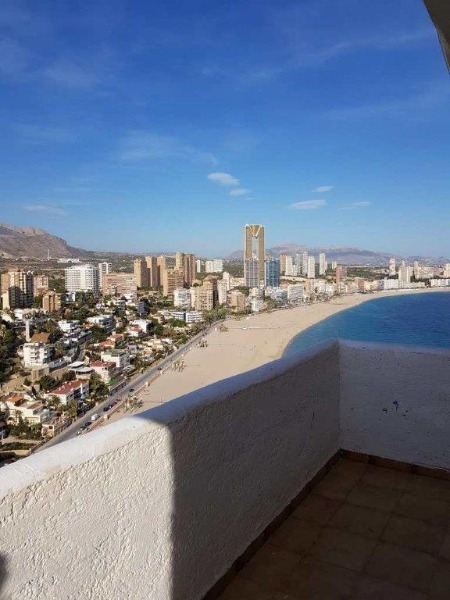 Benidorm itself can offer good value property and has been a well established tourist town since 1925. The population of around 70,000 makes it one of the larger towns in the region and the mild winters make it an all-year-round place to live. It is well connected to Alicante and Denía by train and is just 40 minutes by car from Alicante airport. A rule established in 1954 stating that all property built must have a an area of leisure land still holds good today which means buildings less cramped together and more space to breathe. A rule established in 1954 stating that all property built must have a an area of leisure land still holds good today which means buildings less cramped together and more space to breathe. It has 3 main beaches and one of the highest buildings in Spain, Gran Hotel Bali, which stands a proud 186 metres tall. One-bedroom apartment in Benidorm for €158,000. With more than 5500 British living in Benidorm, there is access to all the things an expat in Spain would want. There are several British schools and it is easy to find British foodstuffs, newspapers and magazines. Properties tend to be modern new builds or older style apartments. Despite the mild winters, you would be sensible to look for a home with heating as some days can become distinctly chilly. The newer property is more expensive than older ones but you can buy an older apartment with a stunning view over the Mediterranean and mountains, as well as access to a communal swimming pool, for less than €160,000, like the one to the left. 55 km north of Alicante lies Altea with a population of 22,000. The climate is Mediterranean with hot summers and gentle winters. The old town is typically Spanish in flavour, crowned by the Plaza de Nuestra Señora del Consuelo from which there are lovely vistas of the town below. The old winding streets will take you down from the summit past many artisan and craft shops to the fishermen’s district, still in use today as Altea is an important fishing port. All types of sport are available from golf to trekking, water sports to baseball. It has 8 kms of beaches and lovely views of offshore islets. The Tuesday weekly market is very popular and the town becomes very lively after 8.30 pm when the bars and restaurants start to open. Don’t be put off by Brexit – arm yourself with the facts in our free guide, How to Live in Spain After Brexit. The Altea Forum is an online way to meet other British people and many from other countries. The cost of living here is much lower than in Britain so for many retired people on a pension this is good place to move to but also for young families as there is an international school in the town. Property is very reasonable apart from Altea Hills, more of which later. This gorgeous house with three bedrooms is on the market for just €280,000, which is reasonable for the area. 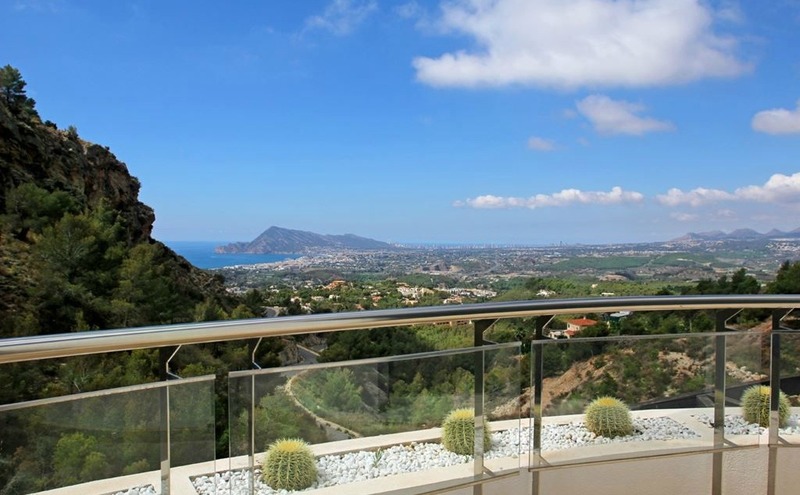 If, on the other hand, you’re looking to treat yourself to the very upper end of the market, then you can find plenty of property on the north Costa Blanca. Here are some of my top areas. Let us return to Altea in the north of the Costa Blanca or rather to Altea Hills which has some of the most luxurious properties in Spain. Nestling amongst the pine trees, overlooking the sea and high up above the town are some fabulous villas. Just 60 kms from Alicante-Elche airport, you will find a premium residential resort which is close to the old town of Altea but peaceful and secluded. Property here is built to the highest standards with quality materials and beautifully designed communal areas. Very close by is the Don Cayo Golf Club and the Greenwich Sports Marina where luxury yachts bob up and down in the clear waters. There is also a tennis club and spa within the complex, used by many celebrities and sports people from around the world. There are 3 bars, 2 restaurants and a café, 3 pools and one heated indoor pool as well as play areas for children. 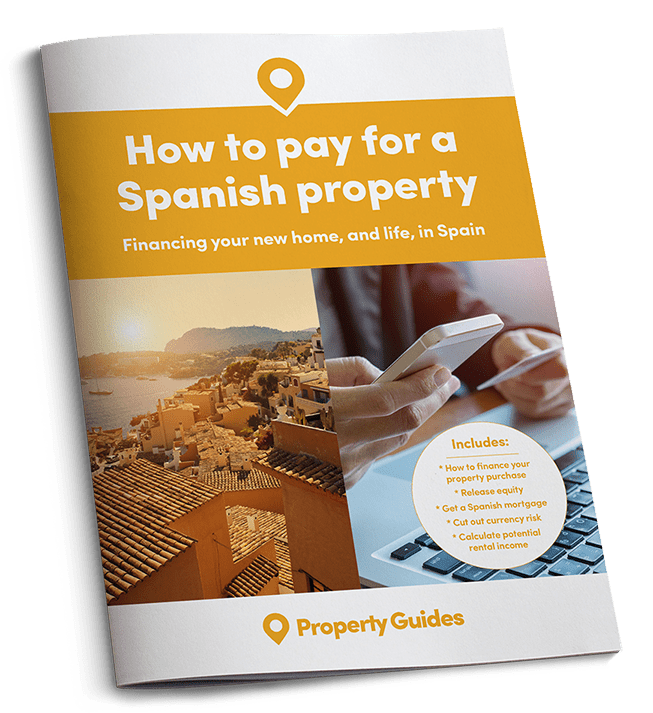 If you are ready to buy in Spain within the next few months, call our friendly Spain Resource Team on 020 7898 0549 or email Spain@propertyguides.com for free advice. Why, you might ask, is the marina called the Greenwich Marina? Well, it lies exactly on the Greenwich meridian, (longitude 00º 00’ 00”). The spa is one of Spain’s most prominent wellness centres and is located inside the Altea Hills Hotel. The resort has 24 hour high security which attracts many people in the public eye who seek property in a quiet and private situation. A villa here with 4 bedrooms and 4 bathrooms with panoramic views is for sale at €760,000. 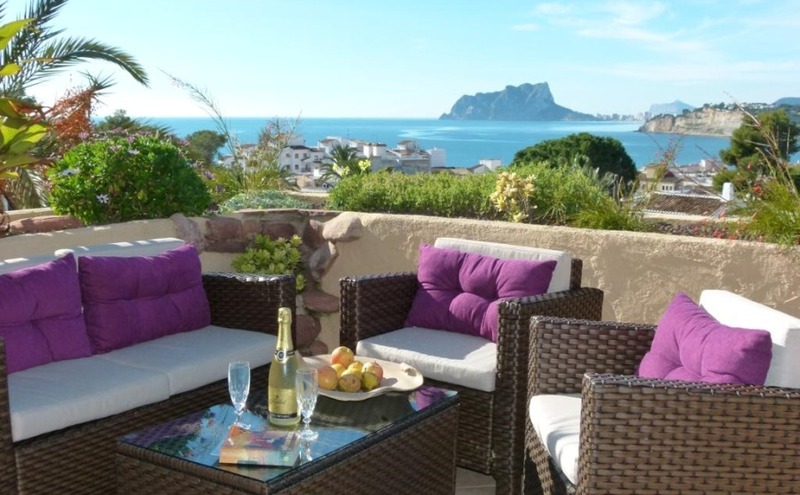 This four-bedroom villa offers panoramic views down to the sea from the Altea Hills. Dénia is certainly one of the most expensive areas for property in the north of the Costa Blanca, with the average price of 1,467€ per square metre. Dénia lies halfway between Alicante and Valencia and is one of Spain’s most delightful and culturally rich towns. With almost 44,500 inhabitants, it is a thriving place where property prices continue to climb. Humans have lived here since prehistoric times and the town with its surrounding area is a strong testimony of the several civilisations which have made it their home over millennia. As with other locations in the region, 3000 days of sunshine a year favour this part of Spain. Since the town is on the coast itself, it can boast 20 kms of wide beaches where every kind of water sports can be enjoyed. They all hold a European Blue Flag, meaning that the quality of the water and cleanliness of the sand is high. Dénia is another genuine Spanish working town unlike Jávea to the north which is mainly a tourist hotspot. The town has two prestigious golf courses, La Sella and Oliva Nova, various spas and an excellent hospital. There are several smart bars and restaurants to discover with many on the seafront and it also has a marina and large port. The town has several 4* and one 5* hotels, which go hand in hand with upmarket property to be found in and around Dénia. A ferry goes to the Balearic Islands, the AP7 motorway is close by and it takes around 60 minutes to reach either Alicante or Valencia airports. There are British and international schools in the town. This beautiful villa, dating from the 19th-century, is on the market for €970,000. It’s an example of the high standard of properties on the north Costa Blanca, with a large double plot, spacious swimming pool and elegant interior. 19th-century villa with spacious gardens and pool for €970,000. 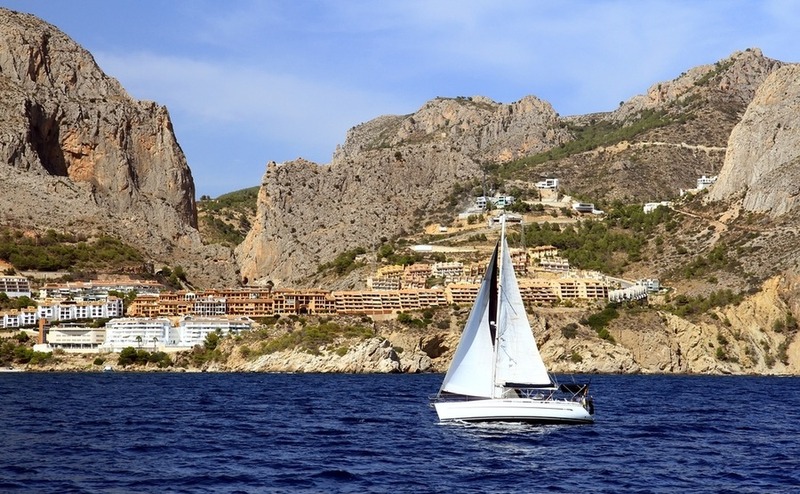 There is no doubt Moraira is an upmarket town where rigid planning laws have blocked the formation of concrete jungle and this is one of the reasons for Moraira being such a haven. It has a pretty marina and 3 beaches, which boast European Blue Flags. In recent years the town has become a foodies hotspot and has many quality restaurants, with 8 mentioned in the Michelin guide. It lies 90 kms from both Valencia and Alicante-Elche airports and is a popular destination for people from all over Spain, in particular from Valencia. It is a short distance from 3 golf clubs and of course, every type of water sport is available. Several celebrities have houses in Moraira including football manager Sam Allardyce and the boxer Chris Eubank as well as the actress Honor Blackman. In nearby Jávea, Nigella Lawson, Terry Venables and Michael Douglas and his wife Catherine Zeta-Jones also have a home there. As there is also a large international community, the area has a cosmopolitan ambiance where English is widely spoken. To buy a luxury 5 bedroomed villa in Moraira with 360º sea views, marble floors, solarium, pool and electric gates amongst its features, you will need €1,490,000. This luxurious,five bedroom villa offers panoramic views out to sea. Click on the image to view this property on the north Costa Blanca. This part of the Costa Blanca offers a wonderful, sunny lifestyle and no matter which kind of property you buy, you can still enjoy all that it has to offer – sandy beaches, little coves, splendid views, great markets, mountains, golf, watersports and really fresh produce and fish, top class restaurants, fun chiringuitos and in the hills, peace and tranquility. 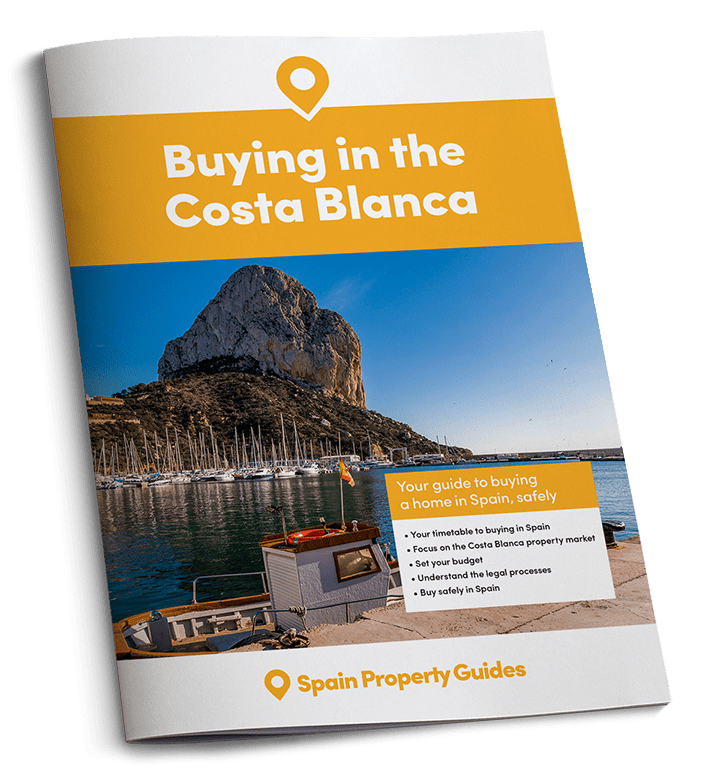 To find out more about the Costa Blanca, download your free regional guide below.